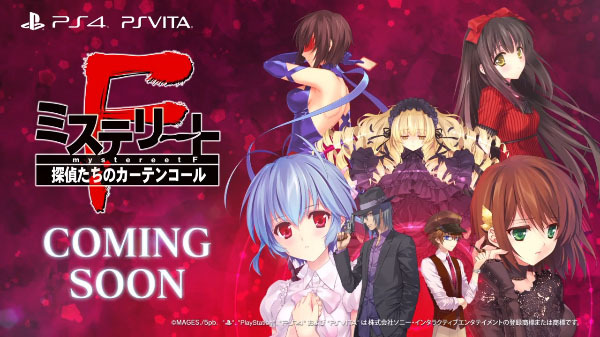 Detective visual novel compilation "coming soon." A new trailer for 5pb.’s 2014-announced Xbox One detective visual novel compilation Mystereet F: The Detectives’ Curtain Call has surfaced, and it features logos for PlayStation 4 and PS Vita, but none for Xbox One. The trailer was included as part of a new route update released today for PlayStation 4 and PS Vita title YU-NO: A Girl Who Chants Love at the Bound of this World. That said, because the trailer is included in an update for a PlayStation-only game, it is possible the Xbox One logo was purposely omitted.